Sometimes a wine refuses to play to type. Take Dolcetto. Conventional wisdom has it that this classic Piedmont grape makes soft, round and fruity wines meant to be consumed young, while your Nebbiolo is in the cellar maturing. Even the best examples are measured against these modest expectations. Yet after tasting San Fereolo Dogliani, a Dolcetto of structure, aroma, texture, earth and dark austere fruit, this paradigm no longer rings true. Unmistakably a wine of Piedmont, it had little in common with the easy drinking wines normally associated with the variety. It demanded a broader view of the grape’s potential. 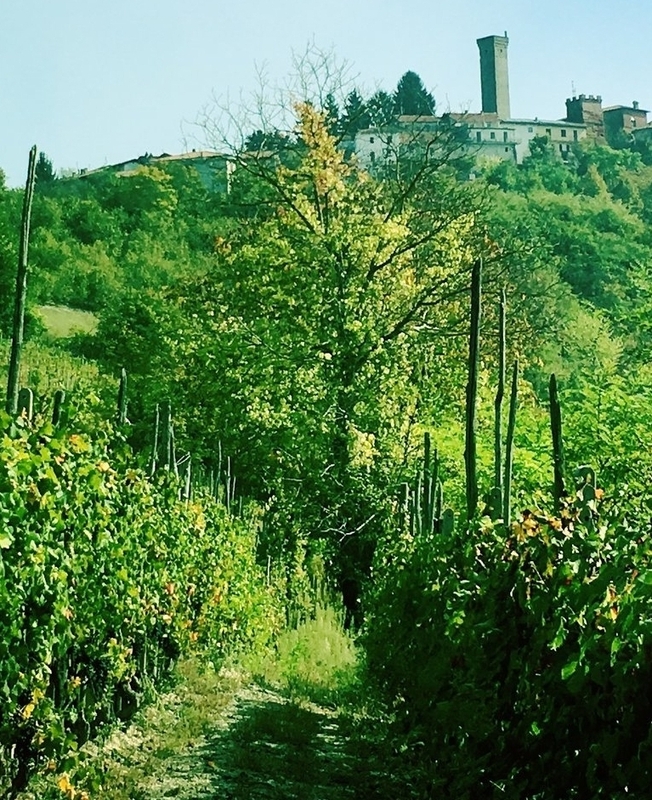 The manager at Eataly Vino told me that the San Fereolo needs to be appreciated in context of wines from the town of Dogliani, a DOCG just south of Barolo at the foot of the Alps, where Dolcetto vines are awarded pride of place alongside hazelnuts trees and untamed forests. As I tasted other bottles from Dogliani, it was clear that Dolcetto di Dogliani is a darker, deeper and more structured creature than Dolcetto from its neighbors to the north. Still, the San Fereolo stood out. There was something beyond a sense of place that informed its remarkable depth. So I wrote a fan letter to the estate’s importer, Rosenthal Wine Merchants, and arranged to speak with the owner, the passionate iconoclast and accidental winemaker Nicoletta Bocca. Twenty-five years ago, Nicoletta was living in Milan and working in fashion and industrial design when her friend Alessandro Fantino, the owner and winemaker of the Barolo estate A&G Fantino, said, ‘I want to take you to one of the best places I have ever seen to live.’ He drove Nicoletta and her husband to Dogliani where at the crest of a hill covered with overgrown vineyards they saw a fantastic house in complete disrepair next to an octagonal church. ‘It was a dream place for people from Milano,’ she recalls. Nicoletta's connection to the region ran deeper than agrarian fantasy. During WWII, her father fought as a partisan alongside the esteemed Barolo producer Bartolo Mascarello. The men stayed close and twice a year throughout her childhood she and her father would visit Bartolo to stock up on wine and food. For much of that time Alessandro Fantino was the Mascarello estate’s oenologist and vineyard manager, and the circle of friendship grew. When you ask Nicoletta what sets the San Fereolo apart from other Dogliani, she launches into a description of her winemaking practices. Picking the grapes when the tannins in the seeds ripen; fermenting in large wooden vats using ambient yeast; macerating the juice on the skins for at least twenty days; leaving the wine in barrel on its lees for two years; and then cellaring the individual bottles for another four years before releasing the wine to market, ready to drink. The regime is grounded in the dual nature of the Dolcetto grape. Translated literally, Dolcetto means ‘little sweet one,’ but it has two faces: one is the fruity side you taste when you bite into it, the other is the polyphenols and tannins that come from the seeds when they ripen. Nicoletta's winemaking practices are dedicated to harvesting the spicy earthy aromas that come from the seeds when the grapes are ready to be picked. ‘You have a choice,’ she says. ‘You can have a short maceration and a fruity wine that tastes like everyone else’s, or you can behave like Dolcetto is a serous wine and focus on extraction. For me, it’s like being in the ocean. You can’t run away from the big wave, you have to dive through it. I dive into the wine and accept all of its characteristics, then I find a new balance.’ The long maceration is the deep dive. The new balance is achieved through the extended time the wine spends in the barrel and the cellar before release, this gives the tannins and polyphenols the opportunity to soften and integrate leading to an elegant wine with restrained dark fruit, structure and persistence. Nonetheless, Nicoletta’s uncompromising vision for Dolcetto is not fully rewarded in the market. Most consumers will pay more for a mediocre bottle of Nebbiolo fermented in stainless steel than the wine she dotes on, and will question why they should purchase her Dolcetto when examples from Alba can be had at at third of the price. Meanwhile, leading Barolo producers often sell fresh and fruity Dolcetto as entry-level offerings, at the same time they are buying prime Dogliani vineyards to make Langhe Nebbiolo, which is also more profitable that Dolcetto made under the Dogliani DOCG label. In the fall Nicoletta harvested the grapes for her debut Dolcetto di Rocca Ciglié. Given the high altitude and fresher temperatures, the tannins in the seeds were greener than she is accustomed to. Still, she made a long maceration after which she tasted the wine. The Rocca Ciglié had lower alcohol and more aromatics than her Dolcetto from Dogliani, yet showed no signs of bitterness. Beyond the local climate, she attributes the difference to the region's ancient soils coming from a place deeper down in the ocean. It appears that the world of premium Dolcetto is about to have an important new reference point from Nicoletta Bocca, the Pirate of Dogliani. A finely calibrated Dolcetto with elegant black fruit, structure, intensity and persistence. This Dolcetto leads with aromas of violets and black berries. It's open fruity character is balanced by fine tannins. Dark fruit and aromas of cloves and sweet spice dominate this highly structured wine. Plums and mineral flavors stand astride aromas of the forest floor in this pleasing Dogliani. An opulent and structured Dolcetto with a touch of smoke on the nose and generous textured fruit. A standout Dolcetto with black fruit on the palate, soft integrated tannins, long length and a bouquet of crushed flowers, cocoa and spice. Dark fruit with a touch of bitter almond and a generous mouthfeel distinguish this wine. A fresh Dolcetto of immense intensity produced from old vines planted in a high-altitude site. A charming Dolcetto marked by concentrated red and black fruit, a hint of cocoa, and fine drying tannins. Nebbiolo through the lens of a master Dolcetto producer. It combines Nebbiolo from vineyards in Dogliani and Serralunga to produce a traditional Piedmontese wine. This Nebbiolo is aromatic with pleasing restrained fruit, integrated tannins and a long mineral finish. The dark earthy fruit and integrated tannins of the San Fereolo Dogliani complement this fork-tender lamb with a rich savory sauce of olives and herbs. 1 whole leg of lamb, bone in and trimmed, 6-8 lb. Place a large heavy-gauge roasting pan on the stovetop so that it stretches across two burners. Warm the pan over medium heat. Add the olive oil. Season the entire lamb with salt and pepper. Once the oil is warm, add the lamb to the pan and slowly sear the exterior, turning occasionally until the roast is golden brown on all sides, about 30 minutes. Add the onions and cook, stirring occasionally, until they begin to take on a straw color, about 20 minutes. Reduce the heat to low and add the tomatoes, garlic, thyme and ¼ cup of white wine. Cover with a lid or heavy gauge aluminum foil and braise the lamb for 30 minutes, then turn the lamb, add another ¼ cup of wine, cover and continue cooking for another 30 minutes. Repeat this for two hours, until all the wine has been used. Add the olives, cover and braise for another 30 minutes. Transfer the lamb to a cutting board tented with aluminum foil and let it rest for 10 minutes. Meanwhile, over a low flame, whisk t1/4 cup of chicken or vegetable stock at a time into the sauce that has accumulated at the bottom of the roasting pan, until it has the consistency of a thick gravy. Season to taste with salt and pepper and transfer to a small bowl. Slice the lamb against the grain. Arrange on a warm platter. Ladle just enough of the garlic and olive sauce over the lamb to keep the meat moist, and then pass the remainder of the gravy around the table for guests to help themselves. *If you don’t have homemade chicken stock on hand, while the lamb is cooking combine 3 cups of water, a peeled carrot, a celery stalk and one leek, onion or shallot. Bring the mixture to a boil, reduce the heat and let it simmer for 30 minutes. This stock will be far more flavorful then prepackaged chicken stock, unless you have access to fresh made stock from a specialty market. The first time I visited Sicily was Christmas 2010. We stayed at a seaside villa at the foot of Mt. Etna surrounded by lemon orchards for a week that ended with a blue moon on New Year's Eve. My daughter was twenty months old and she wouldn’t walk. She’d only jump. She jumped through passport control and the Rome airport and for a seven days she jumped around the property's jasmine scented Arabic gardens. I think of that spot every time I taste an Etna Bianco, wines made from carricante, a white grape that has been growing on Etna for a millennium. The property was a visual tasting note, a snapshot of the citrus, slate and saline qualities that make the wine so refreshing and memorable. We could not visit any of the Etna vineyards on that trip. All were closed for the holidays. Instead, we explored the mountain itself. A local volcanologist led us up to the crater’s rim. It was like walking on the moon, but with a view of the Mediterranean coast. By the time we reached the top, the wind had picked up to twenty miles per hour, the path had narrowed to two feet across, and the gradation of the drop had drawn close to vertical, at which point I fell to my knees and became intimate with Etna's gravelly soil. As much as any winemaker talk, the trek burnished our ardor for nerello mascalese, the dominant grape in Etna Rosso. Not because the earthy, fruity, structured wines contributed immense pleasure to our post-hike picnic, and several meals before and afterward, but because we had personally experienced the brutal conditions under which these remarkable and nuanced wines flourish. Upon returning home, knowledge of Etna Rosso was a great souvenir, a gift that kept on giving. Bottles of Benanti Etna Rosso that could be had for less than twenty dollars, and once opened evolved in the glass for hours, led to the discovery of the more esoteric wines of Frank Cornelissen, and others. Still, when it comes to viticulture, DOC Etna is an island unto itself. The grape varieties and conditions on the mountain are unique in Sicily. In fact, bottles of wine from Etna are the only Sicilian wines that are not required to say Sicilia on the label. Around the world, Etna is quite enough. To get a more global sense of island's wine, it is necessary to take a closer look at nero d'avola, the juicy black-skinned grape celebrated for its role in Cerasuolo di Vittoria, particularly by producers such as Arianna Occhipinti and COS, in which nero d'avola supplies the base notes while frappato contributes vivacity and floral aromas. For all the majesty of the volcano, even on that first trip, my most vivid memory of Sicily remains the few hours we spent touring Siracusa. It wasn’t the Roman amphitheater or the rare Caravaggio tucked into a small chapel. It was the unmistakable quality of the light, and how looking out from the ancient city to the place where the seas merge, you could feel Sicily’s history as a crossroad of Greek, Roman, Spanish, Catalan and Arabic cultures. There was the sense of being somewhere both deeply European and indelibly connected to continents beyond the horizon. In the fall of 2015, I returned to Sicily to tour the Planeta's wineries in Menfi, Vittoria, Noto, Etna and Capo di Milazzo. Once again, we started in Etna, where as a safeguard against lava flow the barrel room is outfitted with a tiny window and a telescope trained on the volcano. Once again, we drove two hours south to the province of Siracusa, this time to Noto. Once again, as I got out of the van I was overcome by the beauty of the light in that corner of the world. The glow at dusk made everything look as it were lit for an art film. I picked a ripe olive from a tree and put it in my mouth knowing it hadn’t been cured, yet thought it looked so plump and round, like a plum, it had to taste good. I was terribly wrong. In the winery, we tasted back vintages of Planeta's Santa Cecilia Nero d'Avola. The wines were silky with flavors of black cherry and smoke, they had aromas of white flowers and tension in the backbone. Over dinner we tried a lovely and slightly more delicate example from the boutique producer Terra delle Sirene. Unfortunately, Noto wines can be difficult to find in the U.S., but tracking them down is worth the effort. Planeta and Gulfi are the two most widely distributed high-quality producers. There are also a number of smaller wineries that can be found at specialty wine shops, a favorite being the Savino Nero Sichilli. Wines are only one of Siracusa province's many draws. We stayed a day, but given the opportunity it is a region I could spend months exploring. The Late Baroque towns of the Val di Noto are UNESCO World Heritage Sites. Rebuilt after being razed by an earthquake in 1693, the majestic stone cities of Noto, Ragusa, Modica, Scicli and Ispica represent the apotheosis of the late-Baroque architecture in Europe. Pastry chefs the world over covet Noto’s fresh almonds. In the heat of the summer, the almonds find their optimal expression at breakfast as locals begin their day with a cooling granita made from the prized nuts. The best granita comes from Caffé Sicilia on the Corso Vittorio Emanuele in Noto's historic town center. Along the coast, the picturesque fishing village Marzamemi is home to the restaurant Taverna La Cialoma, where dishes made with local seafood embody the argument for simple preparations and the finest ingredients. If you prefer more artistry, Ragusa has six Micheline starred restaurants. The region is also celebrated for cherry tomatoes grown in the Pachino commune. The recipe below for Penne with Pesto & Pachino Tomatoes was delicious and full of nostalgia for the summer months when taught to me by the cook at the Etna villa in the dead of winter using supermarket produce. It takes on an entirely new dimension in July and August when tomatoes and basil are fresh and plentiful. We left Siracusa for Planeta's Vittoria winery, a historic walled property with mature trees and climbing bougainvillea located in the center of the island's southern coast, in a rundown area dominated by an energy plant and industrial agriculture. It was the harvest, and the winemaker Arianna Occhipinti joined us for a pizza dinner with her picking crew, a combination of artists and aspiring oenologists from across Europe who had moved in with her for the month because they admire her aesthetics and the purity of her work. As soon as she arrived, she took Alessio aside. She was worried about the rate of fermentation in the Occhipinti SP68, which was unusually slow. As they huddled, it was evident that the local winemaking community was collaborative and tight knit. After the pizza party, we tried to stay up to see the super blood moon. It seemed the perfect counterpoint to the blue moon I'd witnessed on New Year's Eve at the foot of Mt. Etna five years earlier. Moons remind us to be receptive, the special ones even more so. Both trips were far too brief, but the impressions gleaned had opened my eyes, my soul, to Sicily’s history and rhythms, the idea that it is many places and embodies a multitude of ideas and traditions, depending on where on the island you stand, and through whose prism you look. Most of all, it fostered a longing to return and a sense that once experienced, this is an island that stays with you in your bones. A ruby-hued wine with plums and sagebrush on the nose, firm sweet tannins, fruit through the mid-palate, transparency, and a long drying finish. Concentrated wild cherry flavors and aromas of white flower and bramble are balanced by vibrant acidity and soft tannins in this elegant nero d'avola. A blend of frappato and nero d'avola notable for the purity and freshness of its red berry flavors and the scent of wild herbs. This medium-body red wine speaks of earth and flowers. It brims with vitality, juicy red fruit, and aromas of bergamot. An intensely aromatic light red wine, this frappato possesses lifted berry flavors and abundant charm. A floral nero d'avola that tastes of its proximity to the sea. The vineyard's old vines produce rich dark fruit, but the stress of sandy soil and scarce rains ensures that the wine retains its vivacity. If you love Etna wines, this is one to try at least once in your life. It's a wine like an epic Russian novel, textured and nuanced, it tosses you into a world of exoticism but never loses its point-of-view. As delicate and transparent a nero d'avola as you ever will experience, yet there is nothing insubstantial about this wine. It is an essay in the power of a minimalist approach, a perfectly formed haiku. An energetic medium body entry-level wine marked by the scent of garigue, cherry and raspberry flavors, and a pleasing citrus and burnt caramel finish. An appealing dry aperitivo wine with aromas of jasmine and white peach. The bite of fresh pesto, the sweet tomatoes and the nuttiness of the grated cheese take on a creamy texture when emulsified by the heat of the penne. Any high quality cherry tomato will be delicious in this recipe, but if you have access to Pachino cherry tomatoes, by all means use them. Place the quartered cherry tomatoes in a large mixing bowl. Grate the onion and garlic over the tomatoes and gently toss. To make the pesto, quickly soak the basil leaves in cool water and pat dry with a paper towel. In the bowl of the food processor with a sharp metal blade, combine the basil, pine nuts, black pepper, red pepper and salt along with half a cup of olive oil and half a cup of grated Parmesan. Pulse the mixture three to four seconds at a time to avoid blackening. Scrape the edges of the bowl with a wooden spoon. Add half remaining olive oil, pulse and repeat until you achieve a uniform creamy consistency. Pour the pesto over the tomato mixture. Add the remaining Parmesan and Pecorino. Gently toss and let stand for thirty to sixty minutes. Bring a pot of salted water to a rolling boil and add the penne. When the pasta is al dente, remove it from the pot with a slotted spoon or pour it into a colander. Place half the pesto in the bottom of a large saucepan over medium high heat. Add the pasta and gently toss. Add the rest of the pesto to the pot and once again, gently toss. Remove the pan from the heat. Spoon the pasta onto a large shallow platter. Garnish with basil leaves and crushed almonds. Serve warm. Inspired to improve his wines while reducing energy consumption, Michele Manelli, the winemaker at Salcheto in Montepulciano, Italy, has built a remarkable winery that is completely off the grid. Nestled into the side of a hill with a vertical garden planted on its façade to absorb the sun, the winery is as beautiful as it is functional. The roof doubles as a piazza and is equipped with an automated sprinkler system. When the piazza is wet, the sun’s energy vaporizes the water and cools the winery through a simple (yet ingenious) thermodynamic process. The facility is heated by burning clippings and other materials in the local landscape. Inside, there are no light bulbs. Natural light is delivered through long reflective tubes and mirrors. To pump over, stainless steel vats harness the power of CO2 released during fermentation process. Electricity is provided through solar panels. In terms of metrics, the net result is that Salcheto’s winery uses 54% less energy than a conventional facility. At this state-of-the-art winery, Manelli makes Obvius a Rosso di Montepulciano he describes as being made “exclusively from grapes.” For Manelli, this means no added sulfites, cultured yeasts, oak barrels or even electricity are used in the winemaking process. The recipe calls for perfectly intact sangiovese grapes, ambient yeasts and vinification in his stainless steel vats designed to harness CO2 to power the mechanism for pumping over. The wines are aged and bottled in an oxygen free environment. The result is a fresh juicy wine with a complex inner core, and a terrific value at $19 a bottle. Winemakers and fashion designers share the habit of combing styles and techniques from the past with an eye toward improving their current works. For designers it might be a skirt length, stitch or fabric. These days, for winemakers, it is often the use of clay vessels called amphorae. Amphorae are ceramic vessels that were used by the ancient Greeks for the storage and transport of wine, as well as other liquids and dry goods. Typically, they have a large oval body, a narrow cylinder-shaped neck, two handles and a pointed base. The average height of amphorae is eighteen inches, but they could be as tall as five feet. What attracts winemakers to amphorae? In a word: purity. Like steel, clay is flavor neutral, and like oak, it allows for the beneficial passage of tiny amounts of oxygen. Winemakers who swear by the use of amphorae believe it expresses the unique characteristics of the grapes without adulteration. Amphorae wines tend to be darker and cloudier than their counterparts made in steel or oak. The best have the same kind of inner complexity you expect of a deep satisfying broth. They are popular with the natural wine movement because the types of corrections that happen in a modern cellar are not possible with these wines. Their deliciousness depends entirely upon impeccable practices in the vineyard. The use of amphorae in winemaking dates back 6,000 years to the Republic of Georgia where their contemporary, distinctive orange-colored wines are still made in beeswax-lined, terra-cotta amphorae, called quervi. The ceramic containers are buried up to their necks in the earth while the wines macerate and ferment. If you subscribe to the notion that everything old is new again, we recommend giving amphorae wines a try. Some notable producers are Elisabetta Foradori in Alto Adige, Italy; Josko Gravner in Fruili, Italy; Movia in Slovenia; C.O.S. and Frank Cornelissen in Sicily, Italy; and Beckham Estate in Oregon, where the winemaker is a ceramics instructor who makes his own vessels. Why drink Amarone on Valentines Day? Have you ever stared at a glass of this classic Italian wine from the Veneto, the land of Romeo and Juliet? Its blood red hue --achieved through fermenting dried corvina, rondinella and molinara -- is the color of passion, desire, seduction and thirst. It clings to the side of the glass when you give it a swirl. If you allow your nose to hover over the glass’s bowl, it is filled with aromas of plums, chocolate, black pepper, espresso and earth. Then there is the name, Amarone, (pronounced: a-mar-oh-nay), which sounds so close to amore, the Italian word for “love,” but actually has its roots in amaro, the Italian word for “bitter,” as if to remind us that the two feelings almost always come in pairs. Plus, if you handle Amarone with care, the best bottles will last a century or more. While I can’t help you find the perfect mate, or even Valentine’s Day date, in recent years it has gotten much simpler to pick a terrific Amarone. In 2011, after decades of overproduction that led to vastly uneven quality among estates, twelve top-tier producers banded together to create an association called the Amarone Families, dedicated to excellence and the preservation of region’s distinctive artisanal winemaking traditions. These producers are voluntarily holding themselves to stricter standards than required by the DOCG. The families include: Allegrini, Begali, Brigaldara, Masi, Musella, Nicolis, Speri, Tedeschi, Tenuta Sant’Antonio, Tommasi, Venturini and Zenato. If you don’t remember these names, all bottles of wine produced by the Amarone Families are all marked with a hologram of the letter “A”. There is an adage in wine that you can judge a producer by the quality of their entry-level offerings. This is particularly true of the Masi Costasera, Tenuta Sant’Antonio Selezione Antonio Castagnedi and all the producers who founded the Amarone Families. During the Middle Ages, the hilltop towns of La Morra and Barolo fiercely disputed who controlled the prime vineyard lands of Cerequio, one of the most prestigious of Barolo’s crus, or most important parcels of land. Today there is no doubt. Michele Chiarlo, along with his sons Stefano and Alberto, farm almost two-thirds of the nebbiolo vines planted in Cerequio’s calcareous Sant’ Agata marl – vines that yield Barolo wines of particular elegance and finesse with concentrated aromatics that lace ripe berries with dark chocolate and pleasing hints of eucalyptus. A few short years ago, the Chiarlo family opened Palas Cerequio, a boutique hotel in the center of its eponymous vineyards. The hotel is a sanctuary for those who aspire to understand the wines of Barolo thoroughly. Consistent with the local architecture, from a distance it looks like a small cluster of houses. In the lobby are stones from each of region’s grand cru sites. The rooms mirror the Chiarlo’s winemaking philosophy: balancing tradition and modernity, preserving the time-honored characteristics of Barolo while embracing practices that render the wines more sumptuous, less austere. Thus the whimsical Baroque style of the four suites in the historic manor nod to the past, while the remaining five suites, compositions in stone and oak with massive picture windows, look to the future. All are equipped with private spas, stacks of books and musical selections specifically chosen to prime guests for an expansive sensory experience once the wine is opened. Which brings us to the Caveau of Cerequio, the hotel’s cellar where guests can sample the entire Chiarlo portfolio alongside Barolo from other regional luminaries such as Gaja, Boroli and Vietti. It is an ideal tasting environment: temperature controlled with a long table set above a floor lit to ensure a true reading of each wine’s hue. The hotel will also arrange truffle hunts, castle tours and reservations at authentic Piedmontese restaurants such as the Michelin starred Antica Corona Reale and San Marco Ristorante. Short of renting a staffed villa, Palas Cerequio is perhaps the most exquisite way to experience what is like to live among Barolo’s vineyards. Michele Chiarlo Barolo Cerequio is the perfect accompaniment to roasted or braised meats, such as this recipe for braised veal shanks. The Italian wine region Alto Adige looks like an amphitheater carved into the foothills of the Dolomite Mountains. Despite its northern locale, it is one of the country’s warmest growing regions. In Alto Adige, the sun shines an average of three hundred days a year, the curved landscape traps warm Mediterranean breezes, and the towering Dolomites form a barrier protecting the region from chilling northerly alpine winds. The main reason Alto Adige isn’t better known outside Italy is that so many grape varieties thrive in its many microclimates, making the region one of country’s best kept secrets. Its whites are bright and aromatic. At every price point, Alto Adige’s pinot grigio, chardonnay, gewürztraminer and pinot bianco (pinot blanc) are among Italy’s best. It also produces expressive red wines, particularly pinot noir, cabernet sauvignon and the local variety lagrein. Situated where the borders of Italy, Switzerland and Austria converge, the local culture is a blend of German and Italian. A perfect example of this is Törggelen, the harvest season tradition of hiking into hills for a picnic of local delicacies such as speck, chestnuts, apples and cheese washed down with wine from the new vintage. Törggelen comes from the Italian torchio meaning winepress, but the traditional meal has unmistakably German roots. Recommended wineries include Cantina Terlano for age-worthy white wines; Elena Walch for gewürztraminer; Alois Lageder for superb biodynamic offerings especially pinot grigio; Hofstatter for gewürztraminer and lagrein; and Colterenzio, a pioneering cooperative. This may come as a shock, but most wine regions are not inherently beautiful. Grape vines thrive in nutrient poor soil, as do few other plants, save olive trees and succulents. Indeed, it is often the vineyards and wineries themselves that lend our most beloved wine regions their character and charm. Then there’s Bolgheri, a slice of heaven on Italy’s west coast, rising from the Tyrrhenian Sea to the foothills of the Colline Metallifere. Bolgheri possesses all the bells and whistles one could want from the natural world: white sand beaches, mountains, rivers, lush forests, ducks and wild boar. Lined by more than 2,500 cypress trees, even the three-mile road to the village, the grand Viale dei Cipressi, suggests you have entered nature’s castle. As for the wines, picture Bordeaux varieties (cabernet sauvignon, merlot and cabernet franc), along with sangiovese and syrah, luxuriating under the Tuscan sun, while being cooled by a wind stream stretching between rivers along the region’s northern and southern borders. It’s no wonder Bolgheri produces some of Italy’s most opulent and collectable bottles: Ornellaia, Sassicaia, Guado al Tasso, Massetto and Ca’Marcanda immediately come to mind. Bolgheri also offers delicious characterful wines that will spare you the sticker shock: look for offerings from Aia Vecchia, Poggio al Moro and Ceralti. Bolgheri’s dark dense wines grown by the sea are perfect for special evening meals as summer’s warm nights transition into autumn’s cool evenings. Italy’s Piedmont region not only borders France and Switzerland, its food and wine embody many of the finest qualities of the three nations. “Piedmont” means foothills, specifically the lush green slopes beneath the Alps, where pastures yield world-class cheeses and veal so tender, crudo is a local staple. It is an epicure’s heaven: the fish is caught fresh in nearby Liguria, the roots of oak trees are a favorite hiding place for truffles, butter is used as liberally as olive oil, and the most important local grape variety, nebbiolo, is the foundation for Barolo, one of the most collectible wines in the world. Nebbiolo is a thin-skinned red grape that, with enough time on the vine, develops ripe cherry flavors anchored by a bouquet of roses, violets, tar and forest floor. What sets the variety apart is its texture, the penetrating dry tannins accompanied by high acidity. It is the reason Barolo ages gracefully for decades, and why Barolo traditionally takes a good ten years to become approachable. In the past, Barolo producers looking to quicken the process made wines in the “international style,” a shorthand for ample use of new oak barrels and intensely concentrated fruit. These Barolos were easy drinking in their youth but an anathema to purists, since flavors of toast and vanilla along with a perception of sweetness masked nebbiolo’s bewitching aromatics. Today, a more modern approach to making accessible Barolo has taken hold. Wineries like Boroli are using contemporary fermentation techniques to soften tannins, while crafting wines with fresh fruit, clarity and precision. These wines, while not the classics, open a beautiful window into Barolo for nebbiolo lovers keen to enjoy a bottle upon release, pronto! The Boroli Barolo 2008 is a particularly good value. The cool wet vintage meant fewer single-vineyard bottlings and more top lots of nebbiolo in the blended bottling. It goes beautifully with braised veal or wild mushroom risotto. The story of Selvapiana is a fairytale come true. It begins with a beautiful hilltop castle surrounded by olive trees and sangiovese vineyards. Once a summer residence for Florentine bishops and later under five generations of family ownership, the property eventually came under the stewardship of Count Francesco Giuntini Antinori who had no children. As he grew older, the count looked around the castle and at all the villagers and decided that the future of the property would be best served if it was placed in the hands of his estate manager’s two children who were born there. In 1994, four years after his estate-manager passed away, the count adopted the brother and sister and made them his heirs in perhaps the ultimate example of loving the family you choose. The story even has a happy ending. Today the count’s adopted children, Silvia and Federico Giuntini A. Masseti are the winery’s managing directors, leaders in organic farming and international spokesmen for the wines of Chianti Rufina. And if that weren’t enough, the Selvapiana “Bucerchiale” Chianti Rufina Riserva DOCG is a benchmark for elegance in Chianti Rufina and one of Italy’s great wine values. The Count turned 80 years old on September 13th and celebrated with a grand lunch at the winery with Silvia, Federico and 150 of his closest friends and relatives. Guests came from throughout Italy and from as far as India, New York, and Denmark. As Selvapiana was one of several Tuscan estates owned by the count’s parents, cousins from Badia a Coltibuono in Chianti Classico and Capezzana in Carmignano and a niece from La Parrina in Maremma were at the heart of the festivities. The party began in the garden with an aperitivo of wine and cheese from La Parrina, then moved indoors for lunch. There was a primi (first course) of risotto with sangiovese grapes and Chianti Rufina, a secondi (second course) of roasted wild boar and a dolci (dessert) showcasing a giant napoleon topped with 80 candles. Selvapiana “Bucerchiale” Chianti Rufina Riserva was served with the main meal and a special library vintage of the Bucerchiale accompanied dessert. Bring the vegetable broth to a simmer. Meanwhile, combine the olive oil and butter in a large heavy-bottom pan over a medium-low flame. Once the butter melts, add the shallots and sauté for 2 minutes until translucent. Add the thyme and the rice, sauté for 2 more minutes using a wooden spoon and stirring frequently. Add the red wine and stir constantly until the liquid has been absorbed. Be sure to scrape the side and bottom of the pot ensure the rice doesn’t stick. Add the warm broth to the rice in ½ cup increments. Stir until the broth has been absorbed before adding another ½ cup. After about 18 minutes the rice will be tender but firm to the bite. Add the grapes and grated Parmesan, cook for two more minutes, stir gently until the grapes soften. Season with salt and pepper. Serve warm. Italians understand the true role of dessert. After anantipasti, primi and secondi, the dolci need not be a meal in itself, but a subtle shift from savory to sweet to linger over at the end of a meal. Think biscotti, panna cotta, dried figs and rustic fruit tarts. So it is not surprising that they invented Moscato d’Asti DOCG, what may be the perfect dessert wine. Made in Piedmont from ripe Moscato Bianco grapes, the pale gold, lightly effervescent, off-dry moscato d’Asti tends to be nimble on the palate and rich with fresh aromas of apricots, orange blossoms, honeysuckle and almonds. Moscato d’Asti is exceeding low in alcohol (5.5%)--less than half that of Champagne--which makes it a gentle final nip after a glass or two of wine earlier in the night. It is also an affordable luxury, usually for less than twenty dollars a bottle, and crafted by the same venerable Piedmont producers that make collectable Barolo and Barbaresco. But don’t let hallowed names like Vietti and Chiarlo trick you into cellaring these bottles. A mouthful of moscato d’Asti should offer the sensation of biting into a just picked perfectly ripe pear -- the younger, the fresher, the better. Also, be careful not to confuse moscato d’Asti with plain moscato, which is often made from bulk wine and lacks moscato d’Asti’s finesse and charm. Recommended wines include the Michele Chiarlo Nivole Moscato d’Asti, a delicately aromatic tribute to Michele’s father who used to filter Moscato d’Asti with Dutch sail cloth; the Tenimenti Ca’Bianca, a lovely frizzante wine with lingering notes of pine nuts and clementines; and the Vietti Moscato d’Asti Cascinetta, which is luscious and beautifully balanced. Brian Larky, Dalla Terra’s chairman and founder, is a pilot, deep powder skier, white water guide, and dive master. He is also a UC Davis trained winemaker who after five years at Ca’ del Bosco in Lombardy returned to the US to become a winery agent. In 1990 he started Dalla Terra (meaning from the earth) under a business model called Winery Direct, which foregoes the importer and sells directly to the distributers. None of this would matter if all eighteen producers in Larky’s portfolio of family-owned wineries weren’t superb representatives of the styles and traditions of their respective regions. But when you look at his list—Tenute Marchesi di Gresy in Barbaresco, Alois Lageder in Alto Adige, Casanova di Neri in Montalcino, Badia a Coltibuono Chianti Classico, La Valentina near Pescara, Masseria Li Veli in Puglia, to name a few—you realize that Dalla Terra is all about delivering the highest quality wine at the best value. Gaia Gaja may be the world’s greatest ambassador for Barbaresco, Italy, the Piedmontese region renowned for its elegant wines made from one hundred percent nebbiolo grapes. Born and raised in the region, she is the fifth generation of her family to work at Gaja, the family’s celebrated estate. Tasting Barbaresco with her opened our eyes to what makes the wines so beguiling. “For people who love Barbaresco, a lot of the enjoyment comes from forming a relationship with the wine while it is still in the glass. Nebbiolo (from Barbaresco) possesses ethereal perfumes. You can swirl the wine it and make it talk,” Gaia explains. Cantinetta Antinori opened in 1957 on the ground floor of the family’s ancestral home in Florence. Palazzo Antinori, as the trattoria is known, is an homage to the medieval tradition whereby aristocratic families sold delicacies from their country estates by offering those dishes through small windows in the wine cellars of their city residences. Over time, what began as a small shop featuring the Antinori’s wines and olive oils evolved into a popular sixty-seat traditional Tuscan restaurant. Allegra Antinori, a 41-year-old mother of two with luminous green eyes, oversees the Cantinetta in Florence, along with outposts in Vienna, Zürich and Moscow. She also manages hospitality at all the Antinori estates. Her job could be described as demonstrating her family’s commitment to authenticity and finesse through food, drink and generosity. Allegra believes that wine should be an emotional experience. She wants her guests to use their senses to perceive perfumes, tastes and textures and respond to wine viscerally, the way they might to a piece of music or a work of art. She fosters environments at the restaurants and estates that encourage this kind of experience by entertaining elegantly without being overly formal or excessive. She greets guests with a glass of wine, sits everyone at one long table, serves family style and always has something boiling on the stove. In early October, Allegra brought Cantinetta Antinori to New York City as a pop-up restaurant at the Mondrian hotel in Soho. The scene was set as if for an opera, complete with faux marble walls, a replica of the Antinori family tree dating back 26 generations, and a long communal table. The 2008 Tignanello, the most important current release in the family’s portfolio, was served with the simplest dish, gnudi, a dumpling made of spinach and ricotta served in a tomato cream sauce. The pairing was revelatory. The pillowy dumpling revealed the Super Tuscan wine to be elegant and expansive. Of course, for many of us, serving Tignanello requires stretching the budget. After dining at Cantinetta Antinori, however, the wine feels more accessible knowing that the rest of the evening’s shopping requires little more than spinach, ricotta, Parmesan and eggs. Preheat the oven to 400°F. Drain the ricotta well and place it in a bowl. Add the thoroughly dried spinach, half the Parmesan, the eggs, the nutmeg and a large pinch of flower. Mix well and let and let rest for at least 30 minutes. Bring salted water to a rolling boil in a large pot. Using your hands or two spoons, form the ricotta mixture into small dumplings. Dust the dumplings with flour and gently drop them into the salted water. When the dumplings rise to the surface, remove them with a slotted spoon and transfer to an ovenproof dish. Top the dumplings with the melted butter and remaining Parmesan cheese and cook in the preheated oven for 10 to 15 minutes. Garnish with a dollop of your favorite tomato sauce. Serve hot. Life with Wine is about taking all the tastings notes, winemaker interviews, seminars, recommendations, photography, travels and recipes and putting them in the service of storytelling. It is about the way wine connects us to our senses and to the rhythms of the natural world, marks time and goads us to know other cultures.